Global conglomerate Alpha1Corp International on Monday released the official photograph of Talal Malik, its Chairman and CEO, on his historic tour of Dubai in the United Arab Emirates in February 2008, to celebrate the 10-year anniversary of the tour and the accession of Dubai’s Crown Prince. 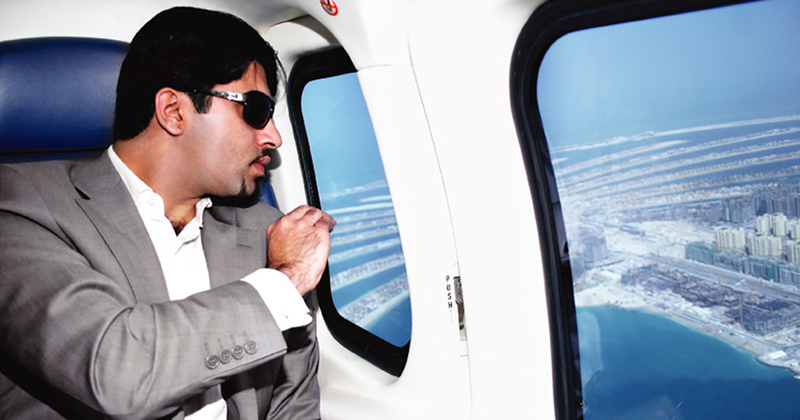 1 February 2018 marked the 10-year anniversary of the accession of the Crown Prince of Dubai, Sheikh Hamdan bin Mohammad Al Maktoum, also known as Fazza, and also a decade since Alpha1Corp’s head, Talal Malik, conducted his historic tour of Dubai by VIP helicopter taking off from near Zabeel Palace in Dubai to have milestone viewings of the glitzy city’s landmark achievements. The Chairman and CEO, Talal Malik, was honoured with the first aerial view of the Burj Khalifa, the world’s tallest building, after it exceeded 600 metres to become the tallest man-made structure on Earth; the first aerial view of The World Islands of Dubai, the world’s largest archipelago of man-made islands, after their completion; and the first view of Atlantis, The Palm Hotel on the Palm Jumeirah in Dubai.